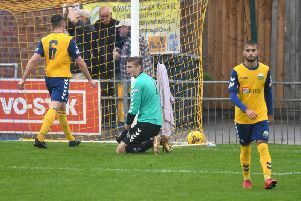 Determined Gosport Borough will aim to gather momentum from their Boxing Day success as they target a place in the Southern League premier division south top 10. The Privett Park team showed lots of character to come from behind for a 3-2 win against Basingstoke Town. Now manager Craig McAllister is demanding back-to-back league wins for the first time this season as they host Hartley Wintney on Saturday (3pm). He said: ‘I am looking for exactly the same amount of commitment. ‘It was a superb result for us against Basingstoke and another great response. ‘Once again the team showed, just like they did at Weymouth, what they are capable of. ‘It is an important result at an important time. ‘We went into the game looking over our shoulders with the teams at the bottom picking up results. ‘The situation at the bottom of the league is very tight. ‘Three or four wins can lift us up into the top 10. ‘That is what we have to set our sights on and try to achieve. Borough have been boosted by the arrival of two experienced players in George Barker and Charlie Davis. Both played a key part in the Boxing Day win and McAllister expects them to have a big influence going forward. He believes their experience can help the younger players develop. 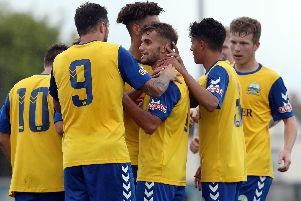 The Gosport boss added: ‘The newcomers give our team a better balance. ‘George is technically very good and has great positional sense. ‘Charlie has played a lot of games at this level and sets very high standards. ‘Up until now we have underachieved as a squad. ‘When I look at the quality we have in the changing room then I know we should be doing a lot better. ‘They are capable of achieving whatever they want. ‘To do that, though, they need to add the key ingredient of consistency. ‘I am sure we will be a lot stronger in the second half of the season. Central defender Sam Roberts is back in contention to be involved after injury.